passed at Danger the protecting 4 aspect colour light signal CW3. in the course of the accident. lighting at East Croydon was illuminated as were street lamps in the area. the Down Through lines. All the lines are electrified on the third rail system at 750V d.c.
from thereon, and 30 mile/h from a point between Barclay and Hazledean Road bridges through East Croydon on the Up Local. use. Work had begun on wiring and the erection of new signals. CV 21/22 South Croydon Up Through Starting signal with a junction indicator for a route over the crossover to the Up Local. CW 4 East Croydon Up Local Starting signal at the London end of No. 1Platform. had undergone a 6-weekly examination at Stewarts Lane Depot on 11th January 1982.
brake van and two more general utility vans. travelling at about 30 mile/h and having passed the protecting signal CW3 at Danger collided heavily with its rear van. Walton as a calm man who handled the train quite correctly. night of the accident. He sat in the lobby and saw Driver Walton come in at about 22.00 and enter the Supervisor’s Office. seem unduly upset. Rowles returned to the station with his car but Walton did not appear for 3 or 4 minutes. 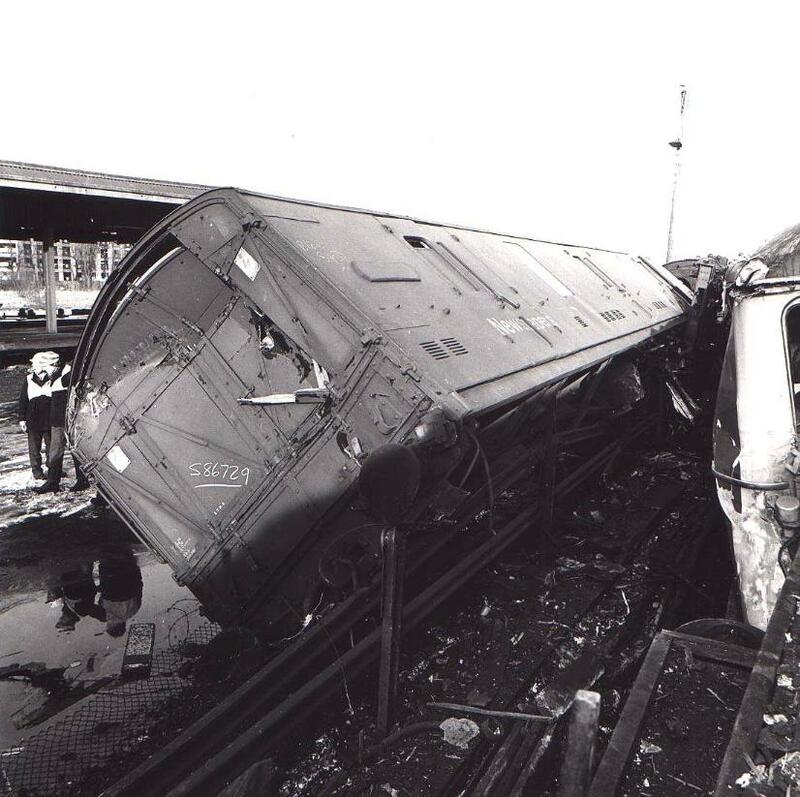 eventually went to bed, and was woken at about 05.00 by the Supervisor with news of the collision. which was done without any difficulty and with the assistance of the shunter. the bogie wagon slid forward. He had not heard a brake application before the crash. that all the wagons were fit and safe to run. His examination was visual and he did not carry out a brake test. coming into Platform 1. He took action to shield a passenger, heard a loud hang, and was showered with debris but was unhurt. the rescue attempt. He heard nothing that might have assisted the Inquiry. junction indicator lamps illuminated as 6G32 approached it. East Croydon. position just in front of signal CV21, was properly illuminated. time an engineer’s train was shunting on the up and Down Through lines and the mail train was at the Up Local platform. emergency services had been called and he protected the lines. replaced Signal CWI to danger. After the collision he replaced lever CW1 normal in the frameand placed acollar on thelever. other than red when he reversed lever CWl for 6G32 he would have noticed it. travelling in the locomotive cab. His driver remarked as 6G32 passed them going in the opposite direction “ ....that's moving”. 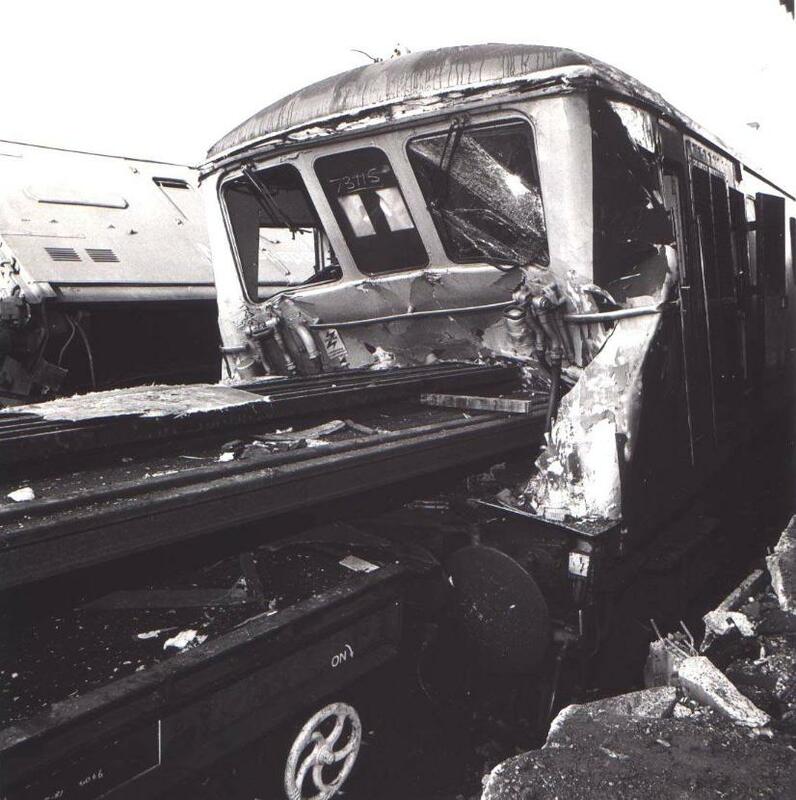 some 14 - 15 minutes after the collision. preparation for stage works could not have led to a false operation of the signalling. 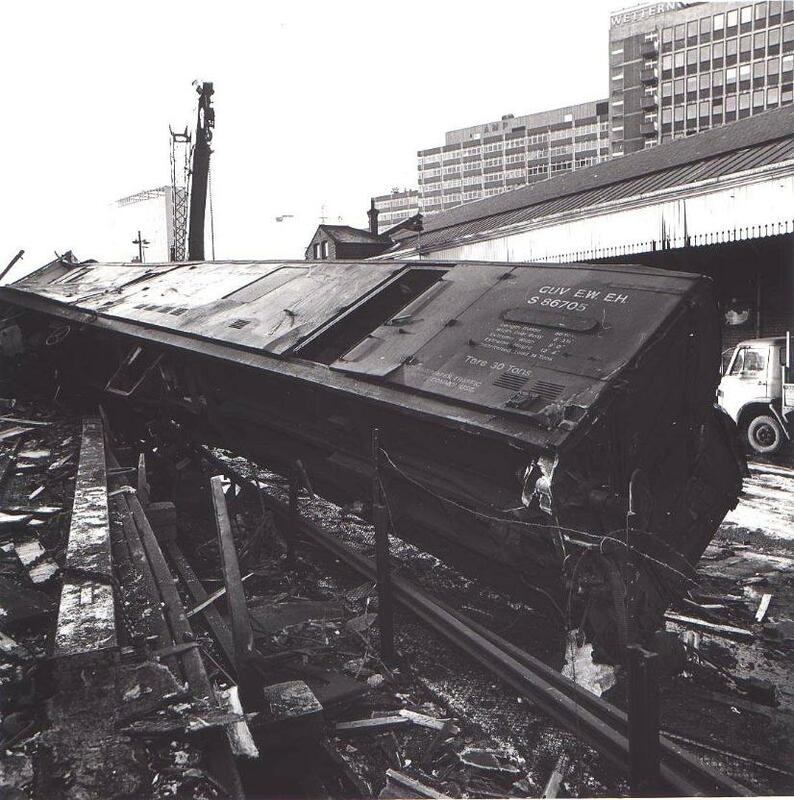 any ‘ lats’ on the tyres or indications of an emergency brake application, showed that the wagon brakes would have operated. one required a heavier than normal pressure to hold it down. 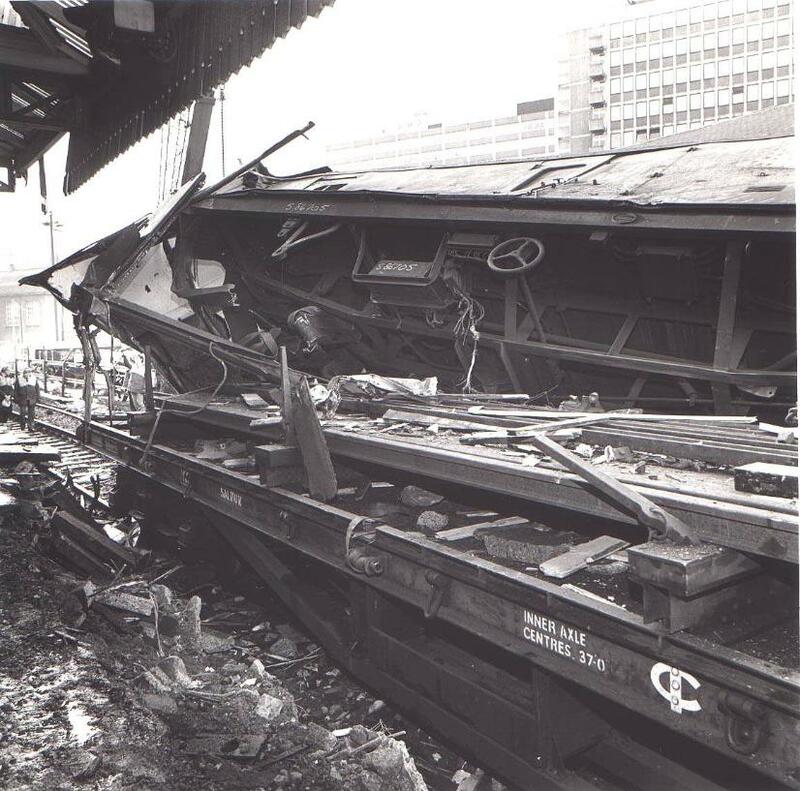 surrounding area of the frame on which were mounted the contactors was undamaged by the collision. cab, and a further five seconds to reach the diesel engine compartment through the electrical equipment compartment. leading him, or of his describing what he normally did rather than the events on this occasion. get clear of the cab as the tests showed. an average balancing speed, for the 6.25 miles from Star Bridge to East Croydon, of 42.6mile/h. control completely so that no warning or brake application was possible. of collision and that there seems to ha\,e been no reaction to the single yellow aspect of Signal CW I.
lost control. Accordingly it seems probable that he was distracted in some way or fell asleep. movements, and because no formal ‘personal needs’ break could be included. Region is due in 1987and I recommend that every effort must be made to achieve this date. effectiveness of the DSD where it is a pedal type and this is in hand. prevention of collisions to benefit all train crew. equipment in the cab back to the bulkhead behind. Some damage was caused within the electrical equipment compartment. quantifying the risk of marking 'safe' areas to which crews should move in such emergencies.